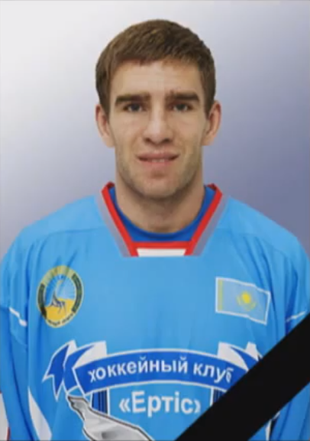 Tragic news out of the Kazakhstan Vyschaya Liga, the highest professional hockey league in Kazakhstan, where Russian forward Dmitri Uchaykin has passed away the morning after being hospitalized due to a hit to the head. Uchaykin suited up Saturday night for his club, HC Ertis-Pavlodar, in a game versus HC Arystan. Midway through the game, he was knocked unconscious on a high hit from Arystan forward Donatas Kumeliuskas. He died at 4am this morning due to a cerebral hemorrhage, which, according to wikipedia, “is a subtype of intracranial hemorrhage that occurs within the brain tissue itself. Intracerebral hemorrhage can be caused by brain trauma, or it can occur spontaneously in hemorrhagic stroke”. Uchaykin leaves behind a pregnant wife and a young daughter. He spent a big majority of his professional career with Amur Khabarovsk in multiple levels of Russian hockey, including the KHL, before getting traded to Gazovik Tyumen (Russia2) mid season in 2008-2009. He would later play two seasons with Yermak Angarsk (VHL/Russia2) before finishing off the last two seasons of his career with Ertis Pavlodar in Kazakhstan. His club announced his passing in a brief statement on their website, expressing "condolences to the families and friends of Dmitry." There doesn't appear to be video of the hit available, which seems reasonable under the circumstances, but this brief clip from the game has appeared on Youtube. It ends with a 20-second shot of Uchaykin's team photo. It goes without saying that this is the nightmare scenario in professional hockey right now. The speed of the game has increased, as has the strength of the players. But the human brain remains as fragile as ever. Hits to the head have become a hot topic in hockey over the past few years, as the governing bodies of the sport have made strides towards taking headshots more seriously. Clearly, more strides are required. Uchaykin was 33 years old.